SALT LAKE CITY — They may not be as frequent or as damaging as those elsewhere, but Utah has some experience with tornadoes. The most memorable tornado in recent history hit Salt Lake City Aug. 11, 1999. The twister surprised the city — it obliterated buildings, uprooted trees and killed one man. It touched down at about 200 South and 700 West and quickly traveled northeast. Damage was spotty as it skipped along the route. The weather conditions were fairly unique: an updraft and a thunderstorm system merged creating a brief but powerful weather event. "In Utah, that's the way most of the tornadoes we get are formed, in that manner," said Randy Graham with the National Weather Service. "Where there is a low level of circulation and an updraft develops over the top of it and stretches into the updraft, and it circulates faster and faster." Graham said there are at least three or four tornadoes statewide every year. The strongest on record was an F3-level in 1993. It hit a remote area of the Uinta mountains. A tornado in downtown Salt Lake City? Never say never! Tuesday marks the 10-year anniversary of that infamous F2-level storm that cut a path of destruction through the heart of our city. Still, some experts say a powerful tornado could plague Utah again, but this time technology could buy enough time to save lives. 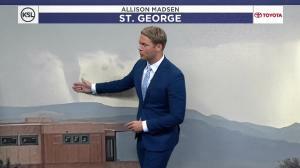 "We now have radar that actually allows us to get a signature to get an alarm that says, ‘Hey, you've got vorticity, you've got circulation in the atmosphere,' " said Kevin Eubank, KSL meteorologist. When disaster strikes, Utahns can get emergency alerts in several ways, like through emergency broadcast warnings and social media. This summer, a commercial mobile alert system (CMAS) will be put in place as well. The system is designed to send a weather alert to a cell phone, a fast way to notify a large number of people at the same time. Similar systems have been implemented for air quality notifications and Amber Alerts. The Amber Alert CMAS sends out text-style messages if an Amber Alert has been issued.